A former U.S. 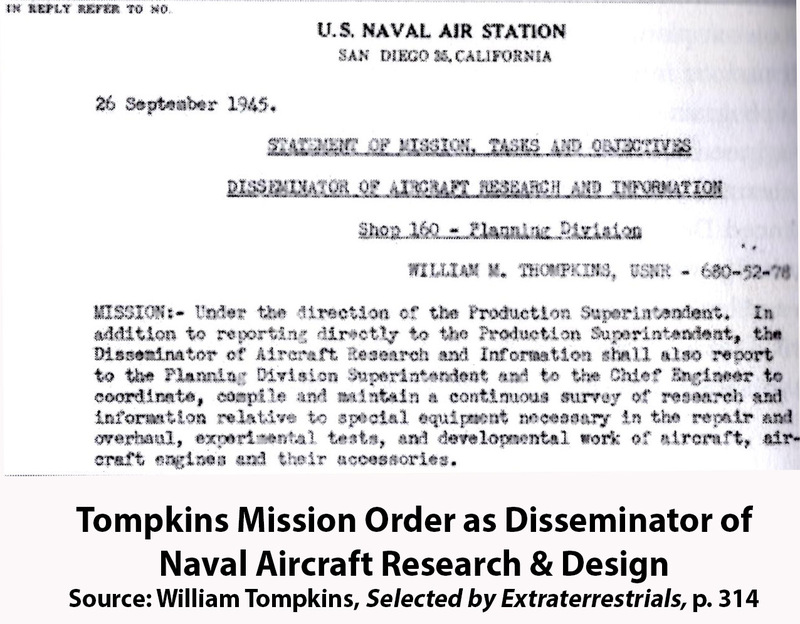 Naval Intelligence operative, William Tompkins, shared his knowledge about the existence of an Italian secret space program in todays episode of ExoNews TV. He claims that U.S. Navy spies embedded in Nazi Germanys top aerospace industries had learned about this Italian program, and briefed a covert Naval Intelligence group, including Tompkins, who was stationed at Naval Air Station, San Diego from 1942 to 1946. Tompkins testimony corroborates Fascist-era documents that in 1933, Italy began a Top Secret study of a captured flying saucer, which was headed by famed Italian inventor Guglielmo Marconi. According to documents released in the late 1990s, Benito Mussolini came into the possession of a UFO on June 13, 1933, which had an unknown flying saucer design and origin. After extensive analysis, Italian researchers concluded the documents were authentic and confirmed the first UFO crash retrieval in recorded history – 14 years prior to the famed July 1947 Roswell Crash.
. No occupants in the object were found. Il Duce created. RS/33 Cabinet (Research-Espionage/1933), it is headquartered at Romes prestigious La Spezia University, the first MJ 12 set up to study the crashed UFO situation in Italy it was headed by Marconi. [MS] Were Mussolinis engineers and scientists helping the Nazis develop these technologies? Guglielmo Marconi along with Nikola Tesla invented wireless radio transmitters. Both believed they had established radio communications with extraterrestrials. Significantly, Tompkins is here confirming that Marconis secret space program was completely separate to Mussolinis more conventional advanced aerospace program being developed prior to the Second World War. This was similar to the situation in Germany where the Nazi SS and German Secret Societies had built parallel space programs. The German secret societies had largely relocated their program to Antarctica, and kept it separate to the space program being developed by the Nazi SS, primarily for the war effort. In the book, Insiders Reveal Secret Space Programs, the cooperation between the Nazi SS and Mussolinis Fascist government in developing flying saucers for the World War II effort was examined. However, what Tompkins revealed is that both the Germans and Italians had separate advanced aerospace programs run by secret societies in parallel to these official efforts. Tompkins claims here correspond closely with those of Corey Goode, who says he came across this information in smart glass pads during his covert service with a secret space program from 1987 to 2007. Goode said that the German Secret Societies denied the Nazi SS the most advanced technologies, which could have been used to win the war. Its therefore likely that Marconis massive secret space program, according to Tompkins, similarly denied advanced technologies to the Italian Fascist government. Ninety-eight scientists were said to have gone to South America where they built a city in an extinct volcanic crater in the southern jungles of Venezuela. In their secret city, financed by the great wealth they had created during their lives, they continued Marconi’s work on solar energy, cosmic energy, and anti-gravity. Working secretly and apart from the world’s nations, they built free-energy motors and ultimately discoid aircraft with a form of gyroscopic anti-gravity. [MS] Marconis Italian studies, was that in any way associated with South America? There were rumors that Marconi went to South America to continue work on the Italian flying saucer program. [WT]  I heard that, but I dont know it for sure. But I heard that, yes. There were a lot of underground facilities in South America too. In addition to his startling revelations about a secret Italian Space Program in his interview released today on ExoNews TV, Tompkins provided further details about the secret Antarctica bases set up by Nazi Germany. The bases used slave labor recruited from a number of Nordic countries to solve their labor shortage as he explained. [MS] Do you know how the Nazis solved their work force, labor force problem in Antarctica? In the book you mention that they took seven million people over there. Were these, kind of like, slave labor? [WT] They wouldnt take any Jews I guarantee you, but yes they were bringing people from all over. Many of the Nordic countries, Denmark, Sweden, Norway, that group. That was [genetically] real close to the Germans. Tompkins recollections of what he heard at the debriefings of U.S. Navy spies during his covert service out of Naval Air Station, San Diego, from 1942 to 1946, are startling. His testimony is supported by documents he has released that confirm that he was stationed at the Naval Air Station during World War II, along with mission orders to disseminate advanced aviation technologies to select U.S. think tanks, corporations and universities. The conclusion that emerges from Tompkins latest revelations is very significant. Not only did the two major Axis powers develop highly advanced flying saucer craft based on revolutionary antigravity technologies, according to Navy spies, but the civilian-led components of these programs were able to relocate their most advanced programs to remote locations, and thereby escape the fate of the doomed Nazi and Fascist governments in Europe during WWII.